Despite astrong local economy, some homebuyers may be sidelined by the mortgage application process and lean inventory, reports the Northern Virginia Association of Realtors. “Although Northern Virginia sellers remain in the driver’s seat, our September data regarding rising home values is a positive indicator to those wondering about market headwinds,” stated 2018 NVAR Chairman of the Board Lorraine Arora. She pointed out that the average price increase of nearly 4 percent and the 3 percent rise in median sales price provide an encouraging picture for long-term appreciation gains. Although inventory remains tight, buyers are not rushing to pull the trigger to purchase right now, stated Gary P. Lange, managing broker of Weichert in Vienna. 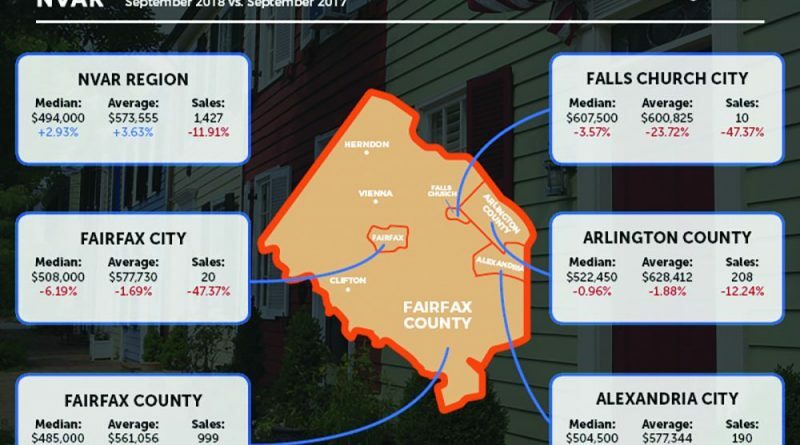 The Northern Virginia Association of Realtors reports sales activity for Fairfax and Arlington counties, the cities of Alexandria, Fairfax and Falls Church and the towns of Vienna, Herndon and Clifton. A total of 1,427 homes sold in September 2018, a decrease of almost 12 percent compared with September 2017 home sales of 1,620. Active listings decreased last month compared with 2017. Listings were down 9.32 percent below last year, with 4,134 active listings in September, compared with 4,560 homes available in September 2017. The average days on market for homes in September 2018 was 36 days, a decrease of 14.29 percent compared to the 42 days on market for homes in September 2017. The average home sale price rose compared with last September, to $573,555. This is 3.63 percent above the September 2017 average price of $553,440.The median sold price of homes this September, which was $494,000, rose by 2.93 percent compared to September 2017, when the median price was $479,950.